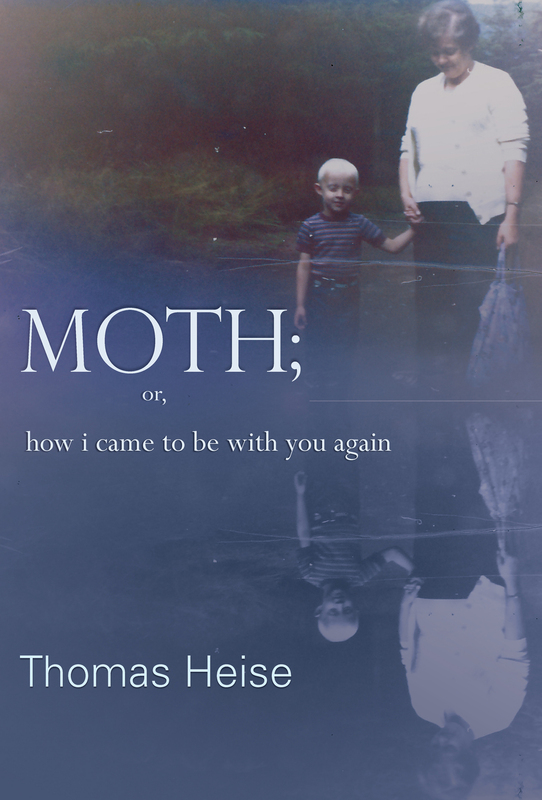 The poems in Thomas Heise’s Moth; or How I Came to Be with You Again purport to be many things. The remembrances of a sick man under doctors’ care. Translations from the German that these remembrances were supposedly written in. Missing-then-recovered documents that, before their translation, were altered or perhaps entirely changed by mysterious, unknown agents. Prose poems and not a novel. Does this make Moth sound like any number of typical modern metafictions, winking, smirking, and too clever by half? Of course it does. But the elusiveness of these poems (and Heise himself calls them poems), fortunately, is not the most interesting thing about them. What we must admire is their measured lyricism, a lyricism surely born in another time and another land. In the best way, this is a poetry of anachronism. To set the scene: the curiously named “T.H.” suffers from “a strange, unclassified condition that makes my experience of time markedly different from that of others.” “I was told,” by doctors, “that the liminal region between what was real and what was not had become for me indistinguishable.” Fool, look in thy liminal region and write! This temporal dysphoria enables and justifies the free-associative journeys that follow. Let’s face it: as a framing device, I’m-a-bit-mad-and-under-medical-observation-but-I-have-a-pen isn’t strong. But it is liberating. It can also excuse a lot. From his ruminations we gradually piece together a picture of T.H.’s life. He grew up an orphan in Germany before the Second World War. He recalls warplanes being paraded in the streets in the 1930s . . . then, in the 1950s, cratered cities, landscaped by different warplanes. The war itself is a never-mentioned hole. In the rubble and the shadows we are in the world of Sebald, The Third Man, or Peter Schneider’s The Wall Jumper. For a time, he did know his parents, if “know” is the right word. He refers to his mother as Y; his father is X (“because nothing else fit”). (A curious reversal of his parents’ expected chromosomal identities takes place here.) And then they were gone. To say that he never quite got over the loss of X and Y is like saying that Niobe was a bit sniffly. “My writing is the offspring of a suborned father without a country and a profane void of a mother whose sadness was without referent,” he says. “Out of a mother’s mouth emerges art like a worm, which is also life,” he affirms again, cheerily. There are only two stages of T.H.’s existence: a mythical childhood and an endless, ageless adulthood. The poem-chapters of Moth are set between 2009 and 2011—when T.H. would surely be elderly, though we get no sense of that—in the cities of Berlin, Oslo, Copenhagen, Prague, and New York. Why T.H. suffers from such wanderlust is not made plain; we are left to assume, simply, that he must be looking for something that he may never find. The choice of cities seems to have no significance. I wondered initially if they perhaps hosted important lepidoptery conferences, but I was being foolishly literal. For although there is one mention of “a species of moth that for nour­ishment sips tears from the eyes of sleeping birds” (!) in 176 pages, the significance of moths is otherwise entirely metaphorical. They are attracted to light, and that is all, and it’s our job to do the work from there. There is no plot, no arc taking the character from darkness to light. There are mere recurrences of things—a woman, a wagon, an A-frame house—and what light there is is seen as if through frosted glass. The narrow, justified columns of Moth are similar to the ones seen frequently in Heise’s earlier Horror Vacui (2006), but in this case they remind us of the text’s supposed origin as a patient’s diary. (Diaries are usually small, aren’t they?) Funny how simply limiting oneself to about nine words per line can do that. Occasional infelicities in the prose suggest the rhythms and beauties of a language not our own, possibly German, possibly T.H.’s private, inner language. “Extinguish” is used as an intransitive verb. “Another go-around” takes the place of the more idiomatic “another go-round.” The alien-sounding “insomniatic” makes several appearances. The aurora borealis is described as “so green I would wonder if it were the glasses I wore” that made it so. The sentence “Those whom fortune neglects is given a glimpse of something that surpasses all expectations” defies all expectations. The region spoke a welcomed insularity and few pleasures during the dark winter months, as if life were a matter to be endured, a long sentence one accepted, for in such isolated climes—reachable by boat or seaplane—any other world existed in a realm of fancy where only children and strangers resided. The whole landscape seemed to me then sheltered from time, not unlike the exquisitely detailed glass snow globes that lined my bookshelf, one every Easter wordlessly arriving in the mail in a wooden crate packed with straw and centred like an egg. “Spoke,” “climes,” “realm of fancy,” “seemed to me then,” even “not unlike” instead of “like”: each of these could be from a translated novel you read in high school, if your high school supplied editions that were last translated in the 1930s. (And surely it did.) But “a welcomed insularity and few pleasures”?! This is perfection, an appealing description of a sort of happy ennui—but only appealing in its exactness. Heise’s T.H. is a man who writes of “opera glasses,” not “binoculars.” The cumulative effect of these quite correct but maybe too correct descriptions is impressive. He extends the practice to his metaphor-making, as well. Like T.H. himself, who in the midst of thought feels as if he has a stomach “filled with ice water,” we experience his painstakingly made comparisons as “an endless melancholy in the con­text of flux.” One wonders if T.H. has ever been happy. When you are chasing something that can never even be named in the text, let alone found, there is no time to waste on imprecision. Identity is a difficult treasure to search for, even when the textscape seems to be littered with clues, mostly maps and mail. In fact, much of T.H.’s memory material arrives through the post: letters, parcels, postcards, real and imagined. Of course, a collection of discrete documents, however large and lovingly curated, does not add up to a story, just as a series of notes is not quite a review. Heise seems convinced, as many before him have been, that the best way to represent the confusion of his character’s mind is mimetically, in this case, through writing that asserts itself in pieces more than it possibly could as a whole. A pile of chain links, rather than a chain. The catalogues of half-dreamed baubles from childhood, the descriptions of furtive encounters with spectral women and trips to nowhere, the confusing and probably self-confused version of the family romance, the chapter (“Berlin, Late Fall 2011”) that consists entirely of “radaradaradaradaradar . . . radaradarxxx” for a page and a half: these, for T.H., are moments of clarity. We established long ago that it is acceptable (not merely voyeuristic) to enjoy the workings of a disordered mind. Heise’s speaker remembers and subsequently forgets more than we ever learn about him. But I cannot deny that it is a pleasure to watch him do it, even if I never did learn how he came to be with “you” again. Erik Kennedy‘s work has appeared in Oxford Poetry and Poems in Which. He lives in New Jersey and at @thetearooms. This entry was posted in Book Reviews and tagged book reviews, Erik Kennedy, Moth; Or How I Came to Be With You Again, poetry, Sundog Lit, Sundog Lit Blog, Thomas Heise. Bookmark the permalink.